The 3' C-MDPM/MDPM Flexible DisplayPort Cable from Kramer is a flexible DisplayPort cable. 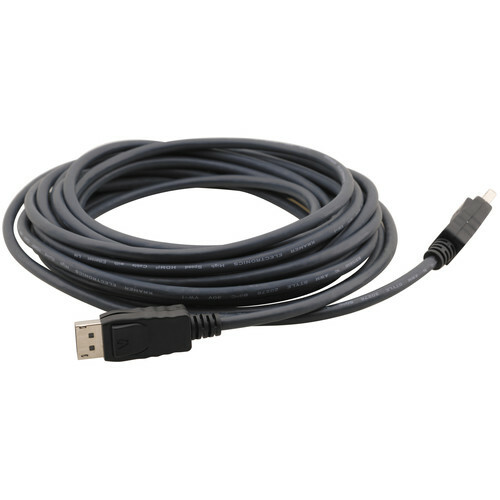 It is a high-performance cable with molded connectors at both ends that supports signal up to 2K and 1080p 12-bit. Box Dimensions (LxWxH) 6.7 x 6.2 x 0.5"
C-MDPM/MDPM Flexible DisplayPort Cable (3') is rated 5.0 out of 5 by 1. Rated 5 out of 5 by Roger from Works great for your monitor My new computer has one HDMI and one DisplayPort output and I have two monitors I want to use.? This DisplayPort cable lets me use the second monitor now.? The 3' length is more than enough without having extra coiled up. My screen is 2056x1080.? Since this cable is 4K rated, it works great for my extra wide but not 4K large screen. does it support up to 144hz?